Danny Pettry provided a one-hour webinar on Dialectical Behavior Therapy in Recreational Therapy on Wed. 9/26/18 through his online RecTherapyCEUs webinar program. Danny seeks feedback from participants to learn how he can improve. Below are comments from people on 1.) how webinar could have been improved and; 2.) what people enjoyed about the webinar. Overall the comments were very positive! I’m definitely pleased. I like to post the reviews for transparency reasons. Part 1: How could webinar have been improved? · I learned a lot of information pertaining to Dialectical Behavior Therapy, I feel the webinar was very good. · Review of some of the Acronyms went a bit too fast to take good notes; however, if the slide guide is available, then it will be ok to fill in my notes. Danny’s comments: I did provide a handout for session — it may have been difficult to find. I also provide replay video, access to slides, and a .pdf guide that goes along with presentation to help people out. hope that helps. P.s. – people often say I talk too slow with my Appalachian accent. · I enjoyed the webinar as it was; no improvements needed. · I enjoyed this webinar. I feel as though I may have been able to take more notes if I had handouts present so that I could mark on. I did provide a handout in the webinar room. You’re the second person who suggested this. I’m going to start creating a .pdf handout to give to people before the webinar. Thanks for the suggestion. · I truly enjoyed this session and learned quite a bit. Danny Pettry comments: Very true. I could have spent several hours talking about this subject. It is difficult to squeeze everything in one hour. · Good overview of DBT, although definitely only skimmed the surface and I may look into taking the paid course about DBT for a more thorough review. I like the interactive portions a lot. Thank you! · Being able to see everyone else’s responses in the question box. · Nervous that it will not be accepted as a CEU, but it was great learning about DBT and Rec Therapy – provides me great ideas to use with some of my residents that I cannot seem to build rapport with or get to come to programs or who do not work well with other residents. Individuals with BPD can be quite manipulative and difficult to work with at times, always great having new ways of communicating and helping them communicate effectively versus negatively. · I think it would be beneficial to extend the webinar, just because there are some topics that would have been great to hear more about/ go more in-depth for! Danny Pettry comments: very true. I could have talked more on the topic and I did offer the self-study program to help people learn more. · It was a very informative webinar. · I continue to enjoy and appreciate all of Danny’s webinars, training, and educational experiences! Danny Pettry comments — I’m super happy you enjoy these. — It is definitely my pleasure. Danny Pettry comments — several people have suggested that. · N/A. the webinar was very informative and Danny made it very easy to follow. · Offering different dates/times for the webinars. I would prefer to have some options in the early afternoon around 2pm during work. Danny Pettry comments – I work as a full time practitioner so it is often difficult to provide training sessions. I can provide some earlier sessions on weekends. Danny Pettry comments — another person suggested that. I’ll provide you with he replay video, a .pdf guide/ summary of this session and the slides. Danny Pettry comments — you got it — .pdf summary coming soon. · It was a good basic webinar. Learned about something I knew nothing about. · I would like to see how all of what we learned about DBT works cohesively. · It was well done. · Having audio would’ve helped! Danny Pettry comments — oh no — it sounds like you didn’t have audio. the audio is on the replay video. I hate you didn’t hear my Appalachian accent. · Not a thing. Great Job! · Thank you for all you do for the field of recreation therapy! Danny Pettry comments — thanks for the kind comments. · This was very educational!! I enjoyed it very much! Part 2: What did you enjoy about this webinar? · I have worked in mental health for about 3 years and have always heard about DBT therapy. I enjoyed the way that Danny related this and made it applicable to Rec Therapy. Now I know how I can be a part of the DBT process. · I enjoyed the contributions of other RT’s. · Enjoyed the skills part of the webinar. · I enjoyed learning what the acronyms are. And the reassurance that i am already doing most of these things though our facility does not teach it. · I think that the content was presented well, in a way that was interesting and easy to learn/ understand!! Will definitely be taking some more of your courses in the future! Danny Pettry comments — more trainings are coming soon. · This was my first time hearing of DBT. I enjoyed learning a different approach to treating mental health patients. Danny Pettry comments — awesome! Danny Pettry comments – true – it was fast. I wanted to provide a lot of information. · New information to me. · I enjoyed learning about DBT since I have heard about it around campus, but never really understood what it was or what it is meant for. Now I do. · Refreshing on validation and techniques. · The content was clearly explained. Quick! · It felt very fitting as I work it a psych setting and this is used there. · He made it very simple to understand the topic and made it a group conversation with the other participants. I enjoyed the examples. · I think you did an excellent job simplifying the concepts. · New information that isn’t over presented! · I like the interactive portions of the seminar and the real world examples provided. · That I gained knowledge about DBT and how to utilize it with RT. 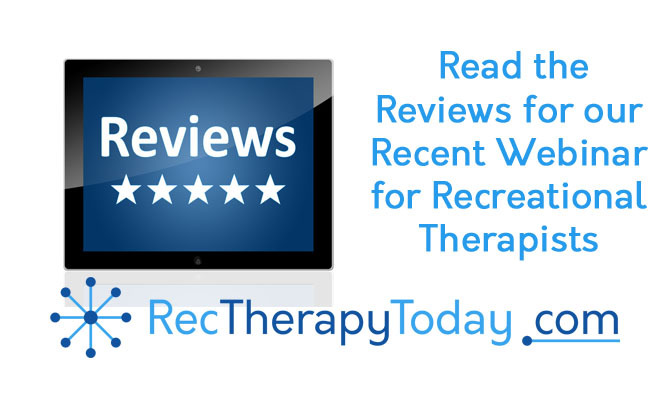 · I enjoyed learning about the different skills for Rec Therapists to use for DBT.